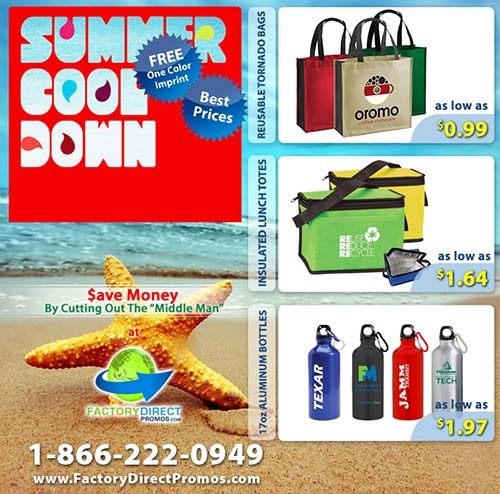 Once a Year Summer Cool Down Pricing on Eco-Friendly Promotional Products! It’s time to cool down the pricing on eco-friendly promotional products with our annual Summer Sale. We know it’s hot outside and the time is right to take advantage of our lowest pricing of the year on three of our hottest eco-friendly promotional products for summer. Make the most out of summer marketing by putting your logo on your choice of our most popular eco-friendly promotional products to help your prospects and customers beat the summer heat! Choose one item, or all three, during the month of June and receive next column pricing. Take advantage of this summer pricing on eco-friendly promotional products HERE. Reusable Tornado Bags are perfect for making grocery shopping easier as they are designed to be comfortable to carry and accommodate a large load of groceries. The laminated, recycled material the bags are made of, gives extra durability and makes them water-resistant for those unexpected summer showers. As with all of our eco-friendly promotional products, full customization is available. Our Tornado Bags are available in a wide array of colors to match your branding and are a great fit for marketing any business, as they appeal to literally every segment of the market who shops. Let your customers know you care about sustainability as these bags, once having lived their usefulness (after offering your business 3-5 years of marketing), can be easily tossed into the recycling bin instead of the landfill. I was just telling our Operation’s Manager, Beth, last week that one of my absolute favorite ways to market any brand, is with customized cooler bags. I am especially proud of our cooler bags because they will give your brand years of use. I have one cooler bag that I received over 10 years ago that I still use at least a few times a week. Cooler bags are great for picnics, summer travel and packing lunch to take to the office, and you can feel safe knowing that our cooler bags are lead-free. This is an important aspect of a cooler bag as food carried inside needs to be safe and free of contamination. Lead in cooler bags has been, and continues to be, a problem in the industry so we take our cooler bag safety seriously. After more than 20 years manufacturing and selling custom reusable bags, we pride ourselves on safety for not only our customers and their end users, but also for the people who work in our factory as well. Look around today in your office, at the gym, the grocery store…really anywhere people are on the move and you will most certainly see reusable water bottles. These days, in every season, consumers from all walks of life are saying no to single-use, plastic water bottles and reaching for their eco-friendly reusable bottles. As the weather heats up, this offers your business the perfect opportunity to fill big a need for your customers and prospects, all while turning them into walking billboards for your business. Each time your customers and prospects reach for your custom, branded reusable water bottle, they will think of your brand and that is a value add you just can’t miss out on. Take a hint from me and take advantage of this next column pricing summer special on these eco-friendly promotional products right now. I know sometimes if you are already working with someone to procure your promotional products it can be daunting to make a switch to someone new. I also know that you are very busy and might not feel like you have time right now to place your order. Don’t worry and don’t wait. After more than 20 years in the promotional product space, we know what we are doing and have a system in place for making the ordering process a breeze. We even have bilingual customer service reps who can work with you to ensure your order is done right and there are no mix-ups. And please don’t forget, because this is a big benefit to you and not frequently offered in the industry, we work directly with our factory to ensure quality, safety and the best pricing on the market. To take advantage of this once a year summer sale on eco-friendly promotional products to help your customers and prospects beat the heat, click HERE.